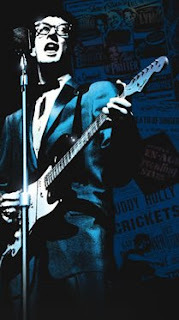 Buddy Holly was born in Lubbock, Texas in 1936. Although his career lasted under two years, he is considered one of the most influential forces in music history. He was a major influence on the Beatles, Rolling Stone, Bob Dylan, & Elvis Costello. He started playing bluegrass music and turned to Rock & Roll after seeing Elvis and was sharing a bill with him a few months later. Holly backed by his band The Crickets hits include "Peggy Sue" 'That'll Be The Day" (inspired by John Wayne's line in the movie the Searchers), "Maybe Baby", "Words of Love", "Everyday", & "Oh Boy". He was only 22 at the time of his death. 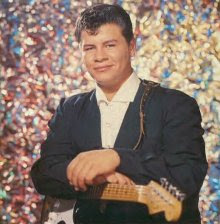 Ritchie Valens is considered the pioneer of Chicano/Latin Rock. He was of Mexican descent & the first to cross over into the genre. His hits included "La Bamba", "Oh Donna" & 'Come On Lets Go". At the time of his death he was only 17 years old. He is a huge influence on Carlos Santana. His girlfriend at the time Donna, for whom the song was written still drives around with a license plate ODONNA. The Big Bopper was born in Texas in 1929. He was a successful radio DJ then turned singer/song writer, known for his hit "Chantilly Lace". He wrote songs for others, including the George Jones' Country hit, "White Lightning", was 28 years old at the time of his death. The Winter Dance Party Tour was one of the early big rock & roll tours of its time. 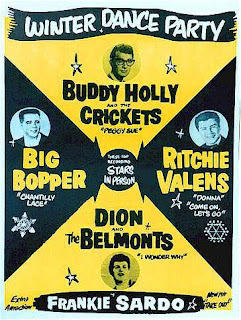 Buddy Holly was the headliner, Dion & the Belmont's, The Big Bopper & Ritchie Valens were all on the bill. The tour bus kept breaking down in the cold Mid West winter, the lack of heat caused frost bite to set in on two the drummers. After a last minute concert in the Surf Ballroom in Clear Lake, Iowa , Buddy Holly decided to charter a plane. He was frustrated with the tour conditions & had no more clean clothes left to change in. Holly chartered a single engine Beechcraft Bonanza B35 (V-tail), registration N3794N, which could seat three passengers in addition to the pilot. The price was $36 a seat. Dion Dimucci of the Belmont's felt the price was to much. He chose not to fly, $36 was equivalent to a months rent for his parents apartment in the Bronx. Ritchie Valens had never flown on a small plane before and asked Holly's band mate Tommy Allsup for the seat. Allsup & Valens flipped a coin after the show to see who would get the seat, Valens won the toss. Country singer Waylon Jennings was also a member of Buddy Holly's Crickets. 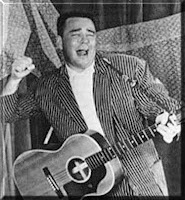 He gave up his seat to The Big Bopper (J.P. Richardson) because he had developed the flu. In a meaningless friendly banter, Holly told Jennings "I Hope your old bus freezes up" when he heard he gave up his seat. Jennings joked back "I Hope your plane crashes" This comment would haunt Jennings for the rest of his life. 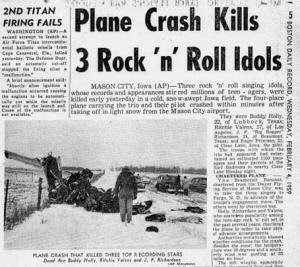 At 1:00 AM on February 3rd, 1959 the small craft left Mason City Municipal Airport in Fargo, North Dakota. The weather conditions were snowy & windy with poor visibility. After 5 minutes, the pilot, 21 year old Roger Peterson, had not contacted the tower & Jerry Dwyer, owner of the Dwyer Flying Service, could see the lights of the plane descend from the sky to the ground. With no contact made after a couple of hours the plane was reported missing. The next morning Dwyer found the crashed wreckage of the plane, in a cornfield 5 miles from its take off point. The bodies were identified by the concert promoter. According to the death certificate Buddy Holly died on impact. His skull was split, he suffered excessive bleeding & multiple face lacerations. He was wearing a yellow leather jacket. In 2007 The Big Bopper's son had an autopsy done on his fathers body. There was speculation that he may have survived the crash & died looking for help. The autopsy found he was killed on impact. It is believed the same occured for Valens. A hand gun belonging to Holly was also found at the crash site & the question arose of the gun accidentally going off caused the crash. 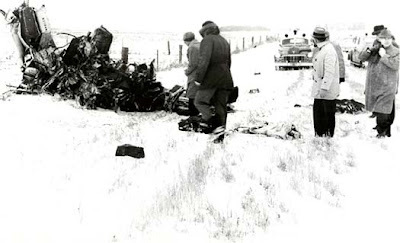 Investigations proved a combination of bad weather & pilot error were the reasons for the crash. A memorial monument was built on the site of the crash, which is private farmland by a fan in 1988. The song "American Pie" by Don Mclean- references the line "the day the music died". It begins learning of the events of the crash & is a tribute to Holly, Valens & Bopper.A film with the same title is set for release in 2009. Nice concise writing. Good job.